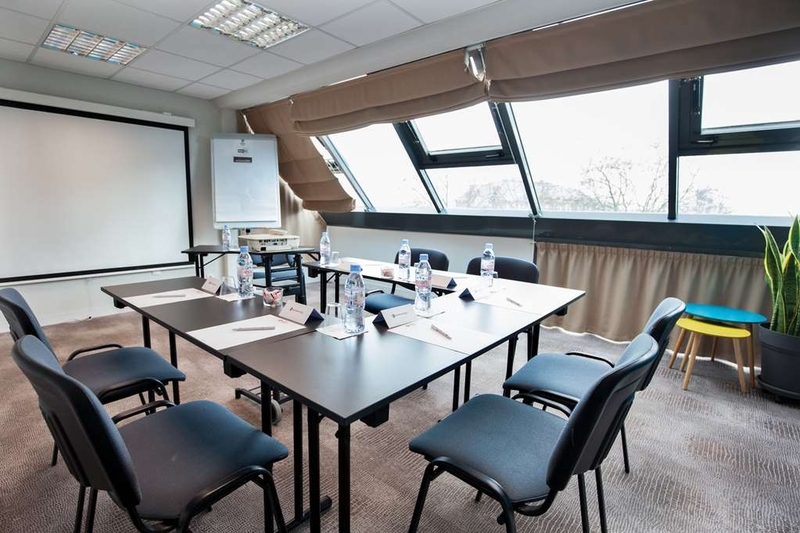 The Best Western Plus Vannes Centre Ville is ideally located in the center of Vannes. Come and experience our hotel near the major tourist attractions. Best price guaranteed and exclusive deals. 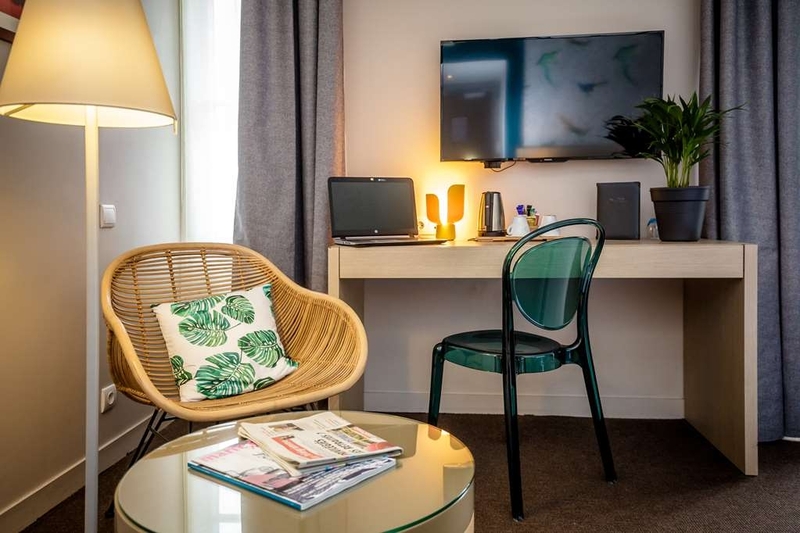 Discover our Best Western Plus® Vannes Centre-Ville, only a walk from the medieval City and its busy pleasure port, ideally located 100 meters from the Congress and Arts Centre. We are a few steps to the marina, the exhibition park and the cruise docks. 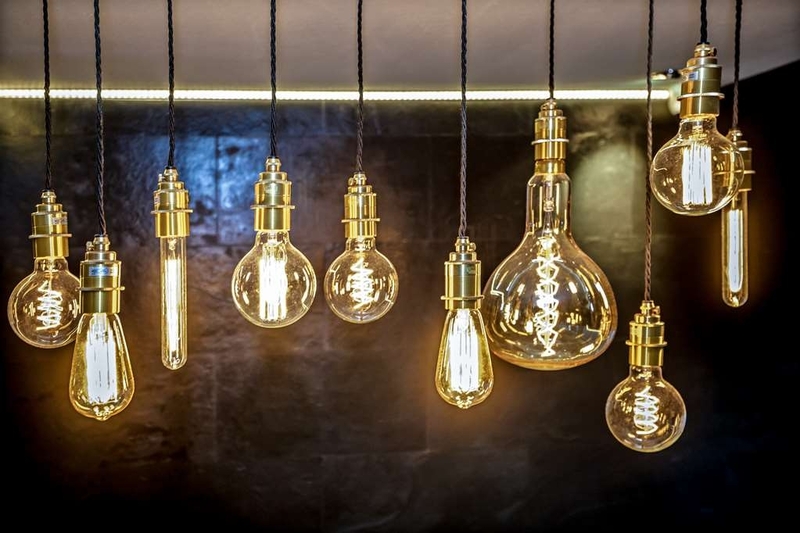 Our property affords contemporary elegance with modern technology. 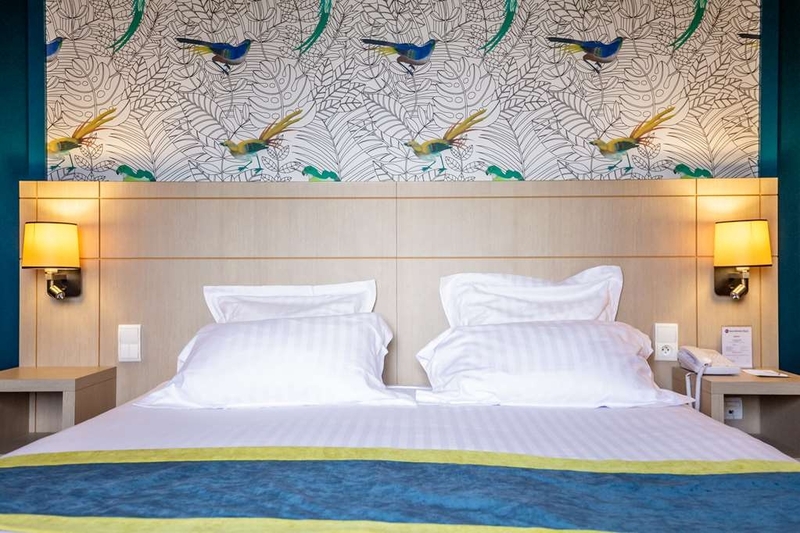 The 58 rooms and family-duplex combine refinement and warmth with a maximum of comfort. Parking place available in our garage (extra charge). The majority of our rooms are equipped with balcony or terrace giving further space for relaxing. 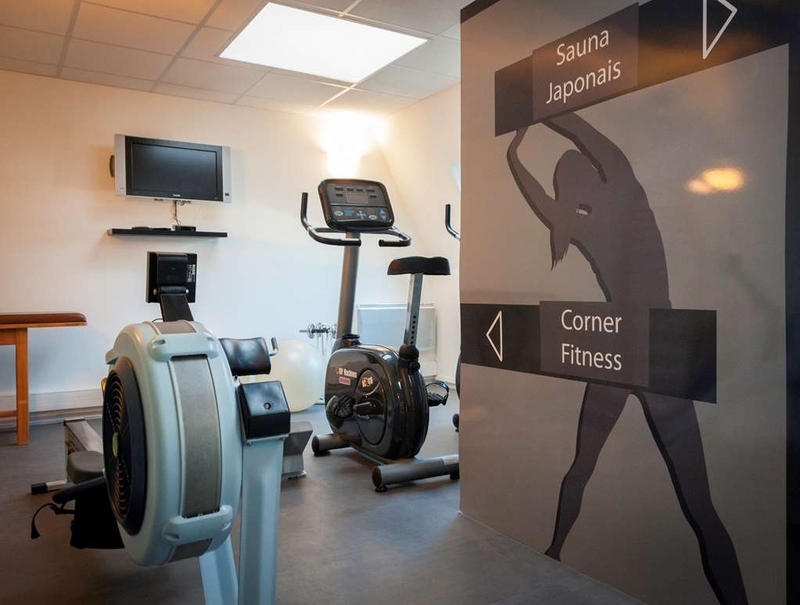 Our fitness centre with a Japanese sauna is open all day long - free access. We even welcome your pet with an extra charge . Appreciate our Restaurant Best Western, our Chef and his team offer traditional cooking incorporating regional dishes and ingredients. Snacks and specially prepared dishes are available in our reception area 24 hours a day. Our attentive and multilingual staff will welcome you as friends, as their intent is to make your stay with us as agreeable as possible: reservations for trips, sporting activities, simple sight-seeing tours in the Gulf, visits to the Islands, guided visits of the medieval city, museums are available. 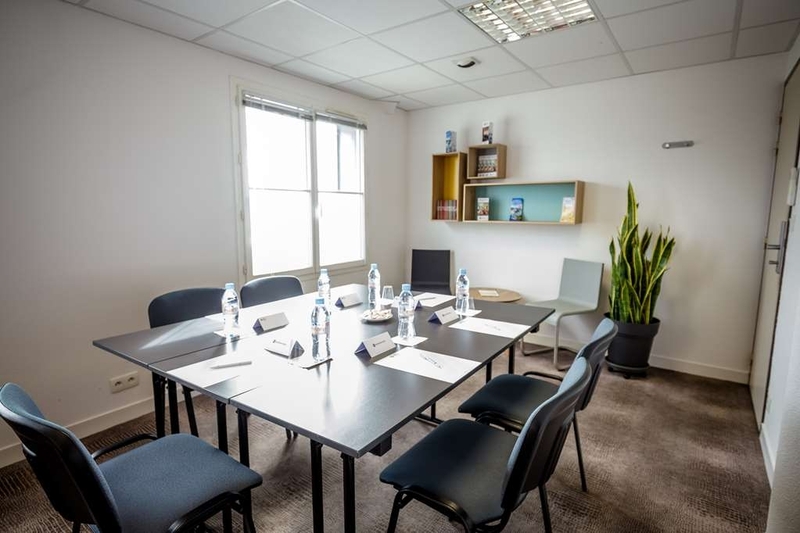 Public transportation is available from the front of the property to ease your travel around the city centre and the Gulf of Morbihan. Enjoy your stay. "Do not leave any valuables in your room"
"2nd Visit - Good location, parking and pet friendly!" 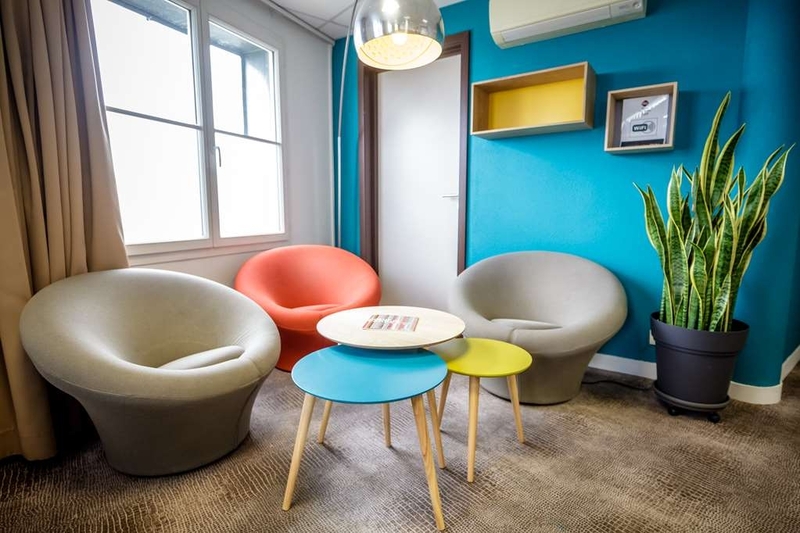 Modern hotel located just off the City centre about 8 to 10 minutes walk to the lovely City of Vannes! 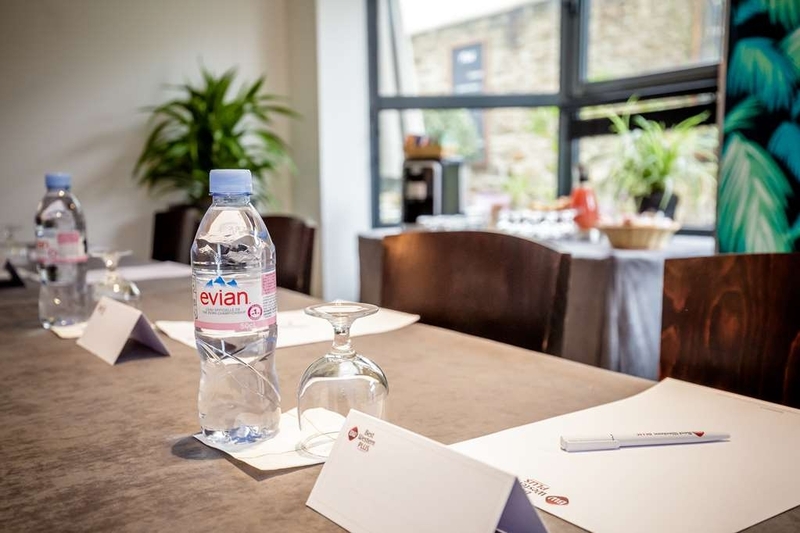 The hotel has excellent underground parking with direct access to reception and rooms which is always a plus point. Staff were friendly and the public areas clean and modern. Breakfast was OK with a reasonable choice. We booked a duplex room with a double and a twin with stairs connecting the 2 floors; toilet and a full bathroom and a small terrace; clean and comfortable. WiFi was OK but did drop out sometimes..... and pet friendly. Rating Good to Very Good in parts!! 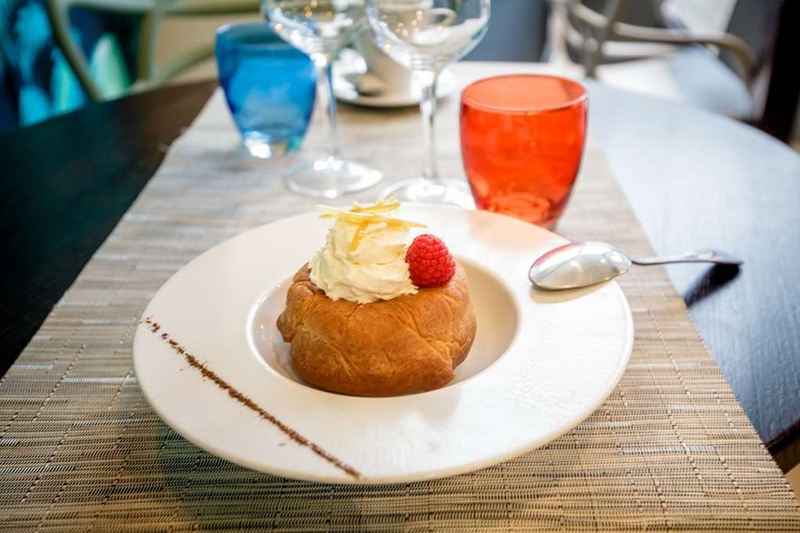 The location of the hotel was within walking distance of Vannes with all its eateries and bars. The room was comfortable, clean and spacious. There was underground parking which was handy as we were touring on a motorcycle. The staff were very friendly and helpful. "Poor Wifi Good location and modern hotel." This hotel is comfortable and located about a 10 min walk to the main tourist area. We booked two rooms for our family for one night Parking is below which you pay extra for. Service was good and rooms were well laid out and modern. 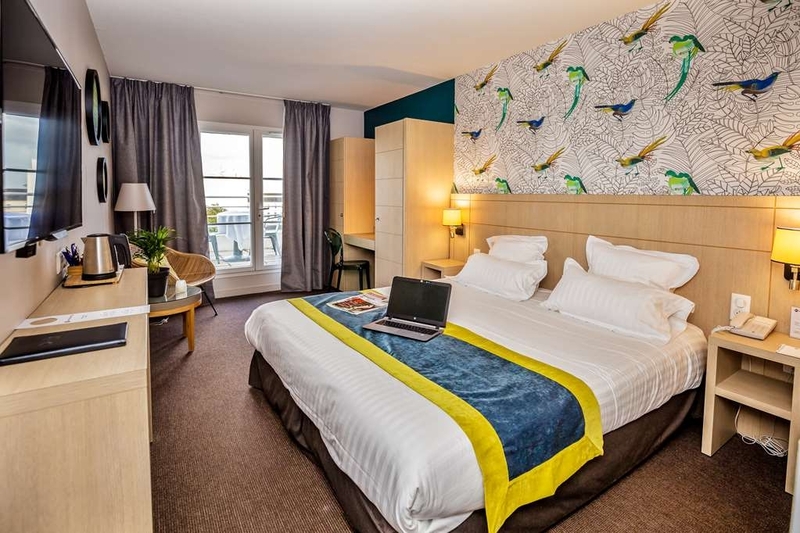 Perfect for a one night stay. I scored them down on the WiFi which was very bad and really something that could be fixed. I ended up blue tootling my iPad to my phone because It was just so slow that you could not use it. The location of the hotel, although not attractive with a building work site opposite, was close to the centre of Vannes and all attractions. On the walk there was a very good bakery. The room itself was spacious , comfortable bedding, tea and coffee making and small table and chairs. The members of staff were most helpful and willing. 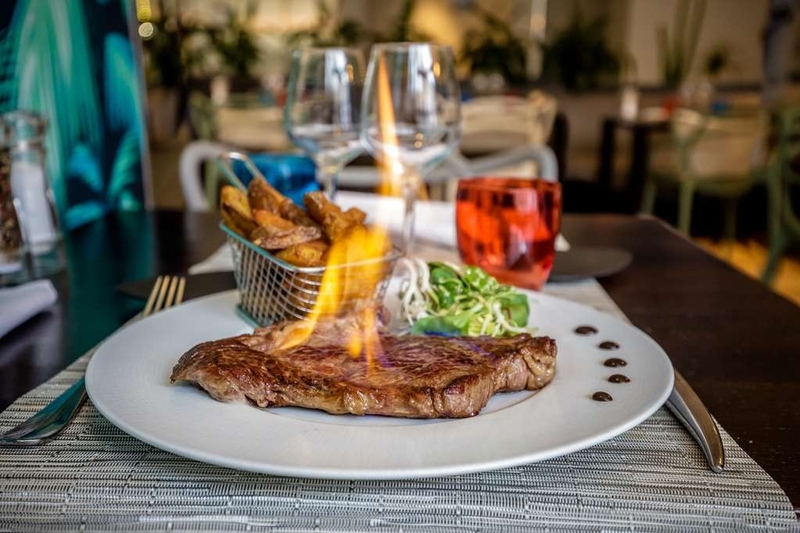 There is a restaurant on site if you wish to stay close to home after a day of sightseeing. The only downside was the corridor on our floor, often crowded with multiple, large laundry trolleys. "Wanted a place convenient to the old part of the city." We were pleasantly surprised by the nice room, bathroom, convenient parking and nice staff. We were intereseted in spending time in the old part of Vannes, so didn't want to hang out at the restaurant there. It is conveniently located, though on a very uncharming corner of busy streets. In the US, Best Western hotels are more like motels on interstates, so we didn't even want to pursue this place, but it was the last minute and there weren't too many charming hotels in town that had any room. The hotel is walking distance from the very nice town. Staff was very friendly. The room was small but ok for 1 person. In general had a good night rest so not complaining. I wouldn't stay here again must say. Breakfast was basic but not bad. Things to work on are the elevator, so slow... The restaurant was not clean! 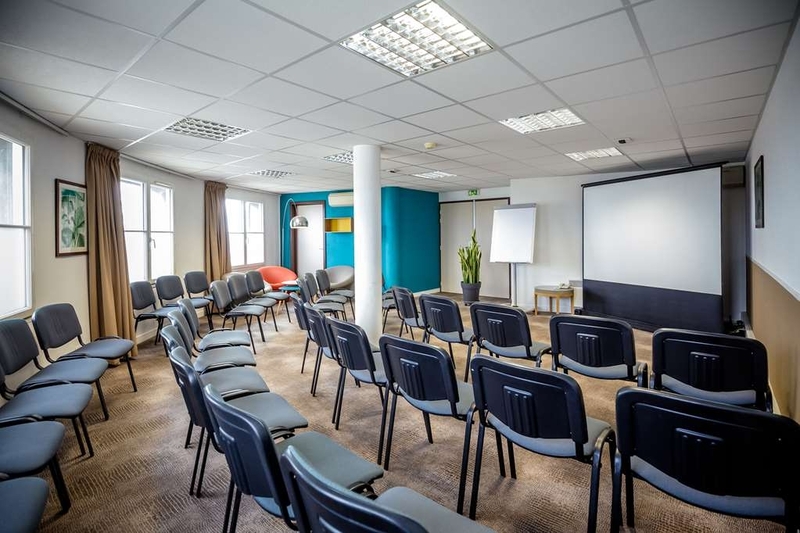 "Reasonable hotel with good parking"
This hotel is situated about a 10 - 15 minute walk from the old town in Vannes. The initial impression of the hotel isn't great in terms of its location on a busy road and opposite a derelict building, but we enjoyed our stay. 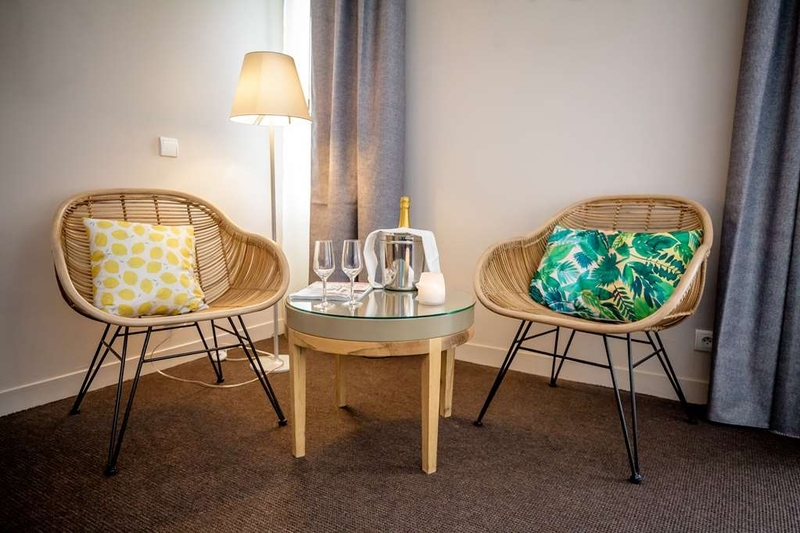 We booked mainly because of the secure, underground parking (you need to book this in advance and parking is not really straightforward in Vannes) which was a reasonable price. 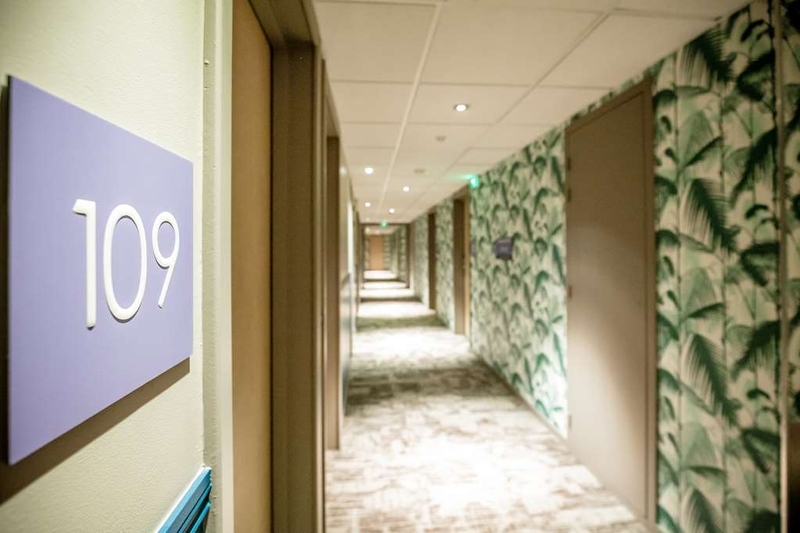 The staff are friendly and our room was spacious and clean. The public areas of the hotel seem to have been modernised and are fine. We did not eat in the hotel as we preferred to walk into town for breakfast and dinner, but we did have a drink in the bar and this was reasonably priced. Minor quibble - whilst our room was very clean, the lounge area and public toilets in the reception really needed a good, deep clean. The blinds in reception were super dusty - not a great impression. 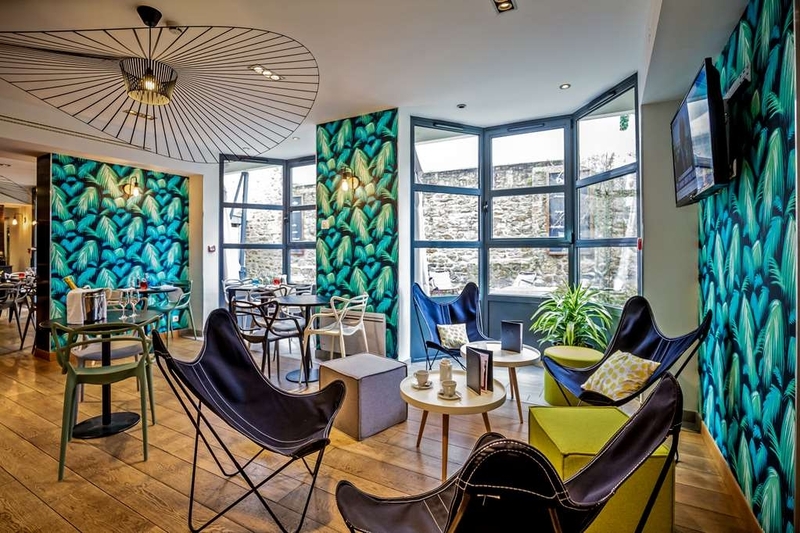 All in all, a good base to explore Vannes and a comfortable stay. "Adequate hotel with parking "
When our flight was cancelled, the staff person was most helpful in assisting us to make alternate arrangements by train. We were able to get to CDG in good time with an airport hotel registration already made. Very small rooms for two persons. It was imposible to open the suitcases there was no place for them.only one elevator. Breakfast was good.The hotel is not really a 4 star hotel.The dinner was not very good. The room was too small for two, no room for the suitcase or to move. Staff was very friendly, location is perfect, parking the same. The breakfast was excellent. All together 'not bad' but due to the tiny room below our expectations. We stayed for 3 nights in July in this hotel It calls itself a 4 star hotel, and the price is consistent with this category. 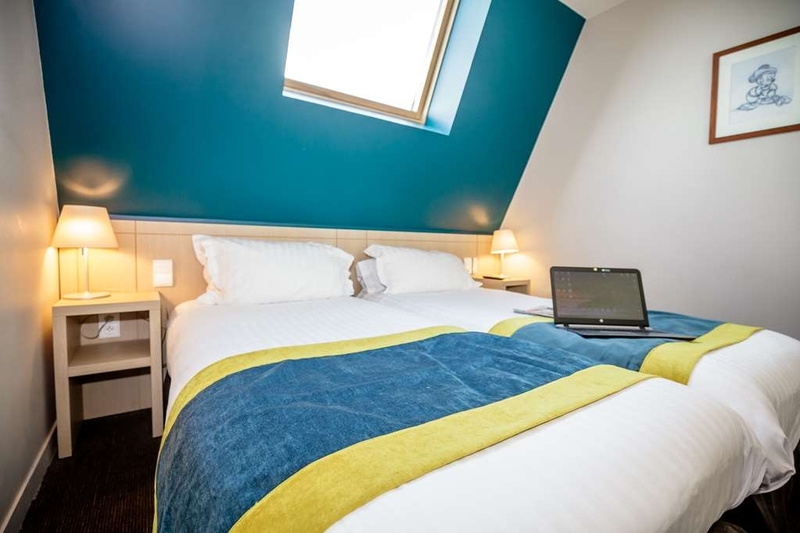 What are consistent with a 4 star hotel are: The location is good 10 minutes walk from Vannes centre. The size of the room. The furniture, there are 2 armchairs and 1 chair, and the bed is good enough. What is inconsistent with the 4 stars are: The room is run down (the ceiling is cracked, bits of the plaster are missing, there are holes in the curtains, the washbasin is cracked) The bathroom is spartan. Amenities are. one shower cap, 2 cotton pads, and 2 cotton tips. The number of towels is two/person. (in 4 star hotels it is 3 or 4) The breakfast is mean. The buffet is almost totally empty, replenishment is insufficient. The one waitress, who can not cope with the cleaning of the tables and the replenishment. On our third day we left our room at 9 am and returned at 14,15 pm. We found our room as we left it, no cleaning was performed. It can happen in any hotel. But: when we requested cleaning the charwoman scolded us saying, that there were no "make up my room sign" on the door so why should they clean it! This can not happen in a 4 star hotel Summing up it is strongly advised either taking back the Best Western name and/or minimize the number of stars. Very convenience from the center of the town to hotel by walking. The room is big enough for 2 persons specially bathroom is good and clear. But has only elevator that is too slow and have to wait for. 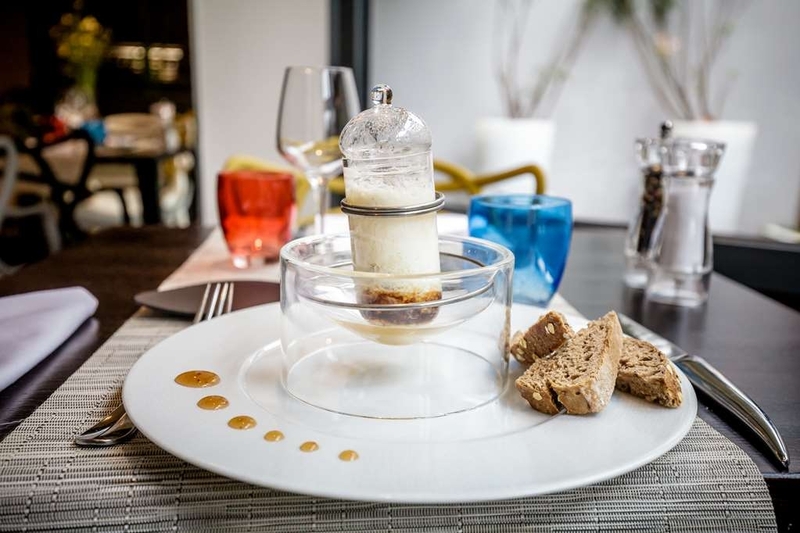 This is a good base from which to visit Vannes. It is a short (10 minute) walk from the historic centre. The underground parking is secure but a little expensive. The hotel staff are friendly and helpful. We had a duplex room which gives lots of space for 2 people. A kettle and tea was a welcome plus. Clean and well serviced. Everyone knows what Best Western hotels are like. Nothing out of the ordinary but a safe bet for a fair price in a city for one or two nights. 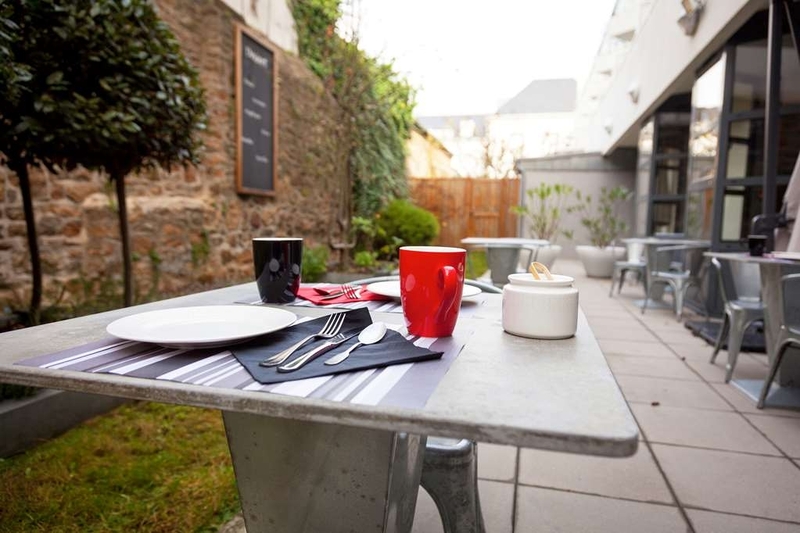 We stayed two nights here and found he location perfect for easy walking into the old town of Vannes. Our room was comfortable; indeed the bed was quite better than many in far more prestigious places. One negative is no fridge. Travellers like to buy the odd drink etc and store in the bar fridge that many hotels provide. Indeed tea and coffee making facilities are provided. The staff here are pleasant and attend to your needs willingly. Our room key card kept not working and each time the reception person re booted it and was most apologetic. Car parking underground is a definite advantage and the cost is similar to what you would expect to pay in a city. Breakfast is ok for what it is. All in all, not a bad place for a short stopover in Vannes. Pros: 1. The room was clean. 2. It is close to the hot spot of the town; about a 5-minute walk. 3. It has a decent restaurant. 4. I stayed in a room on the ground floor, facing the main street. It's surprisingly quiet! I wonder if it has anything to do with the fact that it's a prison across the street. 5. The receptionists were all very friendly. Cons: 1. The toilet bowl in my room is in it's own little room/closet. The space was so tight that you could barely lean forward without having your head hit the door. Other notes: 1. They charge 15euro to check-in your room before 3pm. To their credit, they did make that clear to me when I arrived early, and offer to take care of my luggage if I choose to check-in at 3pm. 2. They charge 9.50euro daily for using their underground garage. I later found that there were cheap (free after 7pm) public outdoor parking within 1-minute walk from the hotel. 3. They added daily breakfast charges to my bill, even though I didn't eat there. They did take the charges off without any hassle when I told them that I didn't have breakfast there. This hotel is really close to the city center, 5 minutes walk. It is very clean and the staff really nice and helpful (they also speak several languages). 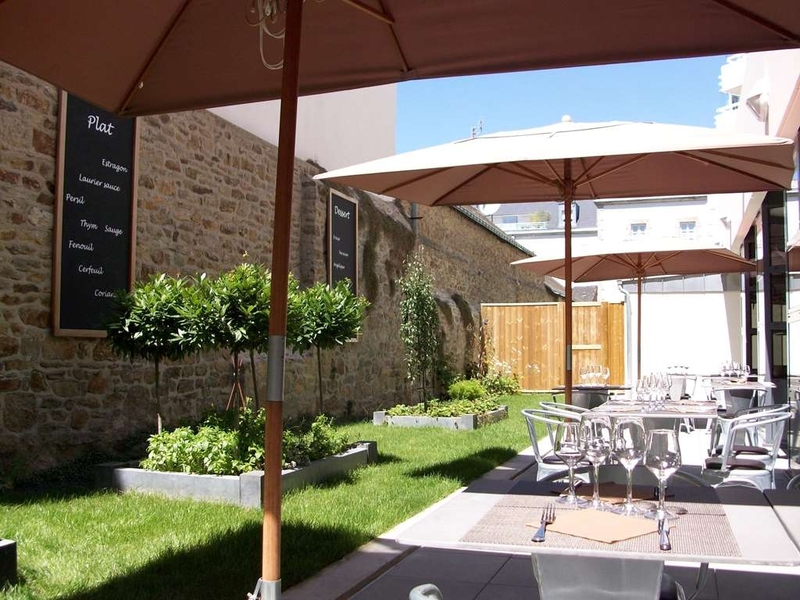 I really recommend this hotel for a stay in Vannes. "A good place in town"
A good adres for a visite to Vannes. Close to the nice center of town, A good start for trips in the beautiful surroundings, A good place to stay in all seasons. Verry nice staff. Always friendly en jolly. The room was Always clean en nicely done. The breakfast was beautiful. Much choice at the buffet during the opening hours. It was a pleasure to be in this hotel. "Great place, nice to stay here"
Is a good and fast checkin, friendly and speaking English :) Parking is down under, easy to operate, safe and closed. Room looks cool, new, fresh and well organized. Small but confy bathroom, little terrace as well. Right besides the road, I can't tell if is going to be noisy at night, daytime is kinda noisy... Hotel has a little restaurant I'm going to check this part now. 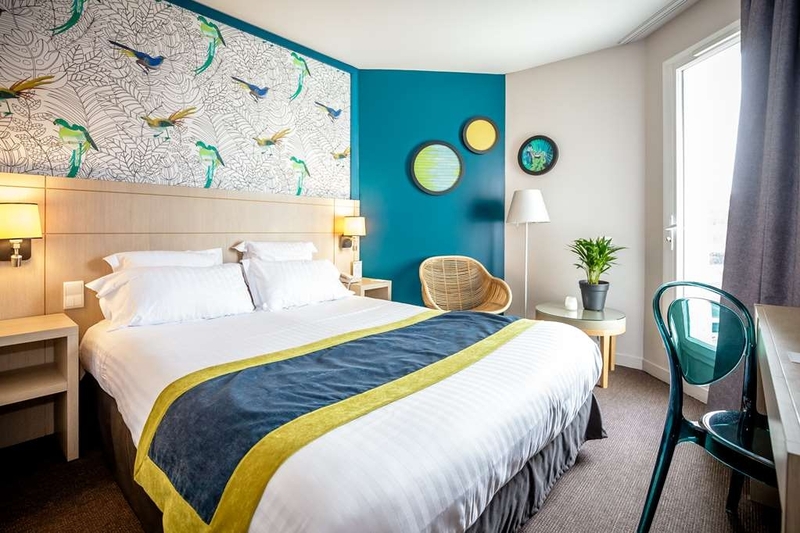 "Great choice for Vannes break"
We were very happy with this choice of hotel for our recent visit to the beautiful small city of Vannes. The pluses for us include just how close the hotel is to the centre, just a 5 minute walk away. The underground secure parking was also great, and worth the 9:50 per day extra charge. The rooms were reasonably comfortable, we were lucky enough to get one with a balcony over looking the interior courtyard. The tea & coffee in the room was also a plus, and unusual for French hotels. But for me the list of negatives started with the lack of real milk, for the tea & coffee facilities, only powered sachets available even after asking reception. There was also no fridge in the room. The quality of pillow on the bed was also poor, not our first complaint of this in hotels. All in all though we were very happy with our stay here, and would return again. "Helpful English Speaking Staff, Great Location, Beautiful Room"
I was in France without my BW rewards card, requesting a free night. I got speedy email replies from the hotel staff, who found me in the system and didn't hesitate to honor my rewards points. They also quickly and kindly sent me instructions on which bus to take from the train station to get to their hotel. Once there, I had a terrible time connecting to the internet service using my phone, but again, one of the staff persisted in helping me solve that problem. After a wonderful stay, I checked out and when I got to the train station, I realized I had lost or left behind my electrical current adapter. I called the hotel and management responded quickly, found the adapter left in the room and called me back. Thanks to their quick responses, I was able to return to the hotel and still get back in time to the station so I didn't miss my train. My room was on an upper level to the left of the restaurant's outdoor patio area. Nonetheless, everything was overall quiet and peaceful. I didn't have a great view but it was so nice to sleep with my balcony doors ajar for fresh, cool air. The room had all the modern comforts I've come to expect in a Best Western Plus. It's in a great location with a bus stop around the corner and just a 5-10 minute walk down to the port. Excellent place for someone traveling without a car. "Nice staff & good location"
We stayed at this hotel more than a week and tried 2 different rooms. We arrived early but when the receptionist saw we are tired of a long flight helped us to check in fast. First room is a bit small but got a king size bed and yard view. Second room was a big room street view which is so convenient. The room doesn't have a fridge but a water boiler. The breakfast speacially crepe with caramel, fresh croissant and richard green tea were my favorites. Their menu for lunch was not in English but their staff will help you with it they have only couscous for vegeterian if not you can try their rabit meal ?? We met the manager of hotel during an event held inside. he was so kind and helpful. Regarding location, Every thing is in walking distance and you will find many cafe and restaurants around it. We spent seven nights here. Had superior room which quite spacious,with kettle etc,safe,nice bathroom and separate loo. Only downside was bed. I was fine but wife uncomfortable. She normally sleeps like a log but mattress probably needed replacing. There WAS aircon in our room but couldn't control it and it got a bit chilly. Our room,like all the superior ones,overlooked the street. I don't like noise but never found it a problem ,whether windows open or closed. Location EXCELLENT,c. 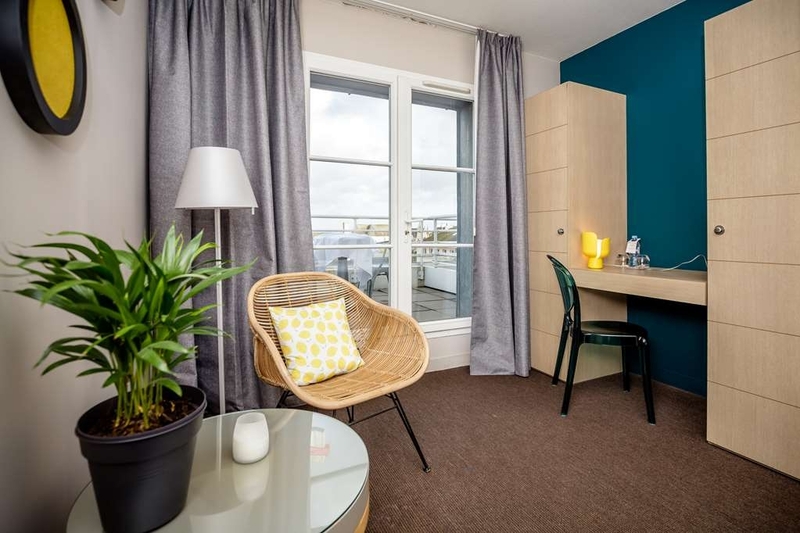 5 minutes walk from the beautiful old town and c. 10 from the port. We dined here first night but Menu pretty limited. Meal ok but lacked fresh veg. We dined in the outdoor patio area,which was fine. Also a perfectly nice inside dining room. Breakfast was pretty varied,including bacon,scrambled eggs,sausages,fruit salad,cereals,cheese,cold meats,breads,croissants etc. Real coffee too,via a bean to cup machine. Staff sometimes overwhelmed by number of guests arriving and more staff would help. We did,however,find all staff very pleasant and willing. The only BIG downside occurred at breakfast time on Saturday and Sunday mornings. On each occasion a different middle aged man arrived at breakfast with a different woman,both of whom could only be described as ladies of the night. very tartily dressed. One "lady" had a man's private parts tattooed on the nape of her neck. Both had skirts barely covering their privates and extremely high heels. In other words,cheap tarts. This is really NOT what you'd expect in a four star family hotel which also caters for many pensioners. Strangely enough,on our way home we stayed in Paris at the Hotel Hor but the only (w)hor(es)we saw were at the hotel in Vannes. Sorry,management,but you need to be far more vigilant,unless you're happy to run a hotel for whores. The reception was very pleasant and welcoming. Duplex rooms were large spotless and very comfortable. 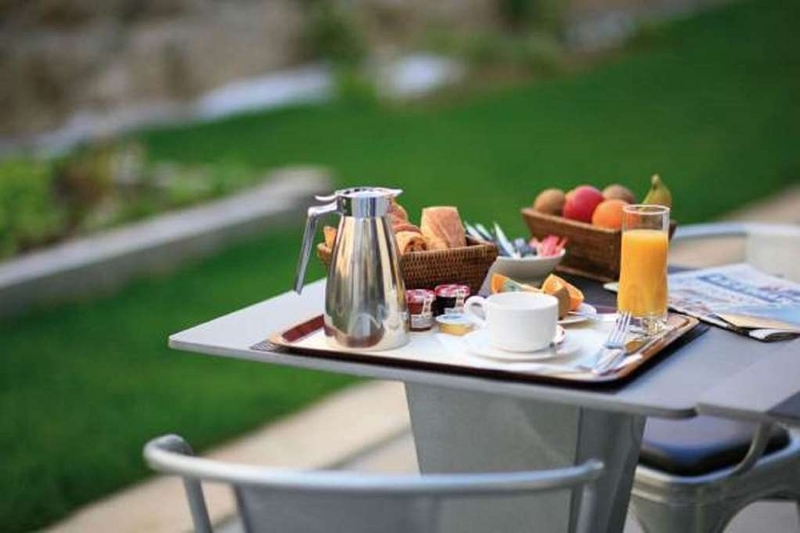 The breakfast was varied and delicious and the staff were helpful and very pleasant. This is my second time using this hotel and I will be back next year. "Very simple, loud and hot rooms." The rooms do not have aircondition. If they give you a room to the street you will be the looser in summertime. You cannot sllep with open window in the night. It ist too loud from the street. Pay attention! Their room names are leading to missunderstandings. The "large twin room" is extremly small (I guess 14 meter/2). You cannot enter your bed from the side - only from the leg-end. Location to the city is o.k. and WIFI works. In the lift there can only go 1 person with luggage. In the patisserie in front of the hotel you get coffe and good croissants - much better than the hotel breakfast for my opinion. We stayed for one night at The Best Western and we received a very warm welcome, the staff were brilliant and spoke excellent English. We booked a family room which was on two levels which was great as our two boys had their own room on the floor below. We found the hotel straight away as it is very well sign posted and the parking spaces underneath the hotel are large which was a bonus. We will definitely book again when next travelling through France. "Really Quite A Nice Hotel"
I'm not really a fan of the Best Western Hotel brand but this was quite a nice surprise. We opted for a superior room and it was very nice. The restaurant only has a limited menu which is fine for me but my wife is a bit fussy. So she really only had one choice. But I must say that the food was very well cooked. So take a look at the menu before you book a table, if you're at all fussy. There is local parking but if you come by car consider booking an hotel space. There are not a lot of them. Would I stay again? Yes of course. Good location, easy walk into centre, very knowledgeable staff. They made sure that we were aware of all the facilities and they pie impeccable English. 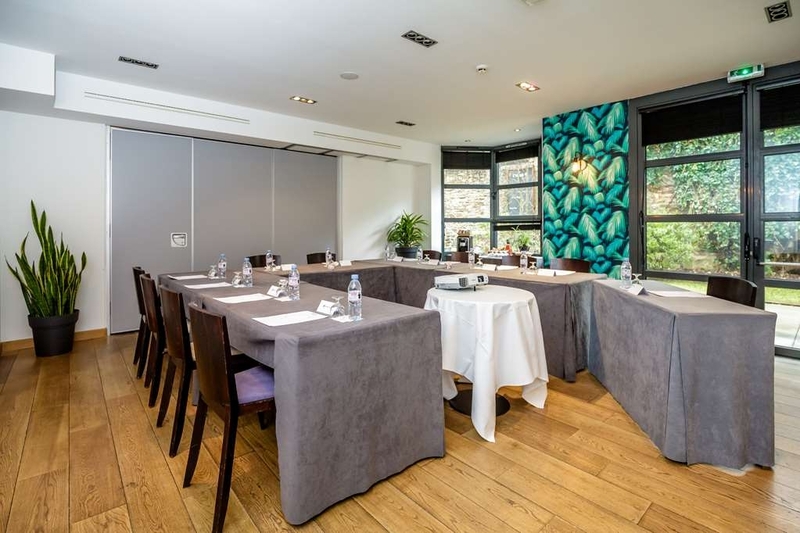 The room was great ,it had a small balcony and since the weather was very warm the French doors gave extra ventilation . A nice shower, then into a very comfortable bed for a good nights sleep, can thoroughly recommend it. Arrived here Friday evening. Nice and modern throughout. Restaurant, breakfast room and bar next to reception desk. All open planning. Can sit out on narrow terrace to eat also.Free parking opposite hotel closes Monday 30 th May. See attached photo for details of alternative parking. Standard room. Everything necessary. Nice to have a balcony to sit out on. Very comfortable and very large double bed. Quite surprised when we came back in @10 pm to find that the bar, although stated, open till midnight that the receptionist had to go and find someone to serve us ( he didn't look too happy to be there). No speciality coffees. Maybe a little thing, but we'd not finished our meal out especially as we thought it would be nice to finish off back at the hotel. So we decided to buy a cognac and baileys and took them back to our room where there was already tea and coffee available. For us, quite surprising for a 4* hotel.Free wifi throughout but didn't always work well from room. Hotel next to Kyriad hotel. In reality a 10 minute walk to medieval part of town with shops then a further 15 minute walk to reach the beautiful harbor where one is spoilt for choice re restaurants which envelope it all around. "If you can FIND it, stay here." Vannes is one of the most difficult places to drive and walk in.Maps and street names do not correspond. Even when asking people for directions, we got "Ne pas ici" ( not from here) consistently!!! It took us almost an hour of driving all over town to finally find the Best Western. Once there, the room was average. Not four star by any means. However, it was clean, and the water was hot. if you stay here, you must speak some French. Even then, drop breadcrumbs if you walk anywhere at all. 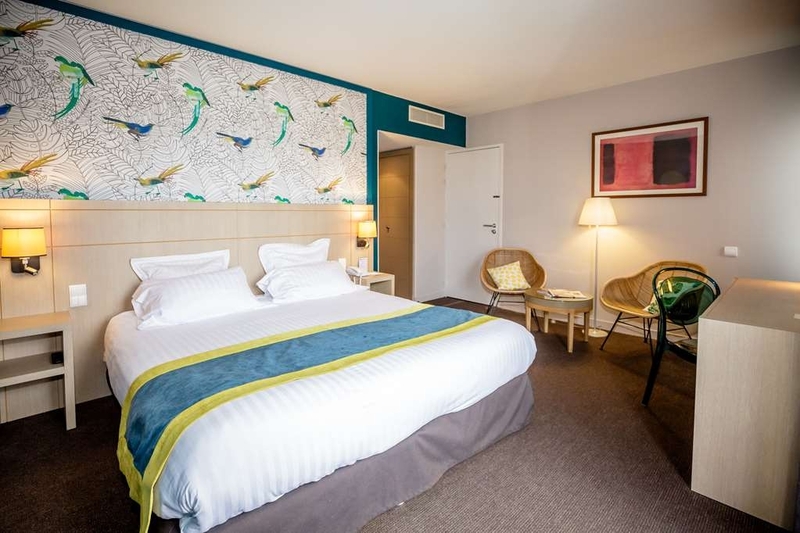 Superb, best hotel on tour, great place to explore Vannes. Thanks. Staff really helpful, rooms extremely clean and organized. Welcome to hotel was start to great experience. Always ensuring we were well catered for by always asking if there was anything we needed. "Third Visit over ten year period, same good hotel." Visited hotel for two nights 07.11.15, having booked a superior room with breakfast. Nice room, good self service breakfast, very clean throughout, staff very pleasant and all spoke English. Very good value for money. A short walk to the shops and restaurants and a little further to the marina. There are very nice walks both sides of the marina, once again we enjoyed a short break, good food in various restaurants. Great place all around. 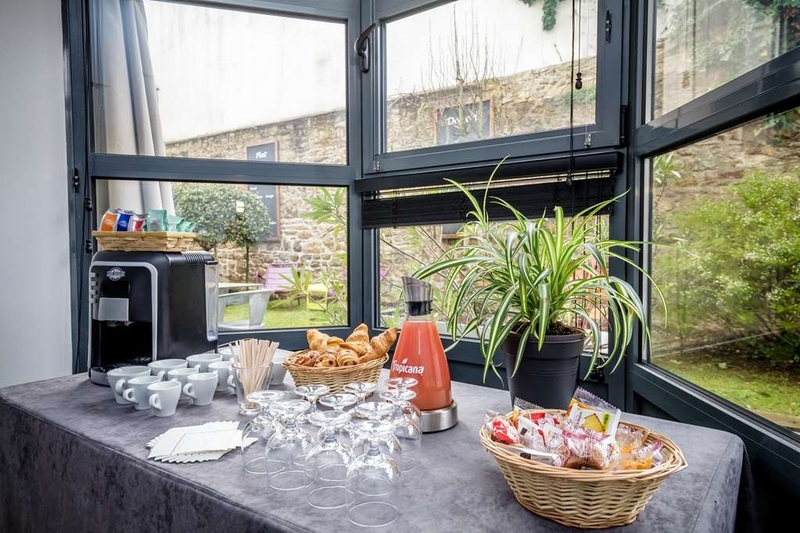 "Very close to the historic district"
- The location of this hotel is only aboput a 5-10 minute walk to the historic district of Vannes. The hotel is reasonably easy to find with GPS navigational aid. The down side of being accessable from a main road is that ithe street noise can be bothersom,,which is was, way into the night. There are two public parking lots accros from the hotel, and the hotel also has underground parking for about 10 Euro/24 hrs. The spaces in their garage are a lot larger than most of the ones we have found in European garages. - The hotel staff is very accommodating. We arrived around 11:00 knowing that check-in starts at 15:00. The room we had booked was available so they let us check-in immediately. - The comp Wi\\fi worked great. - Breakfast was buffett style; both hot and cold items. All where tastly and the selection was extensive. The do have a full service restaurant. "Good hotel near the old town with parking place"
The location is perfect, near the old town. There is a parking place. Hotelroom was good with a desk, a chair and a fauteuil. And a small balcony with a chair.The bathroom was very good. Wifi excellent. Breakfast/restaurant room also okay. Breakfast costs € 14 but there was a lot to choose. A really good hotel within easy reach of the old centre and marina although they are about 10 minutes walk down a slight slope. 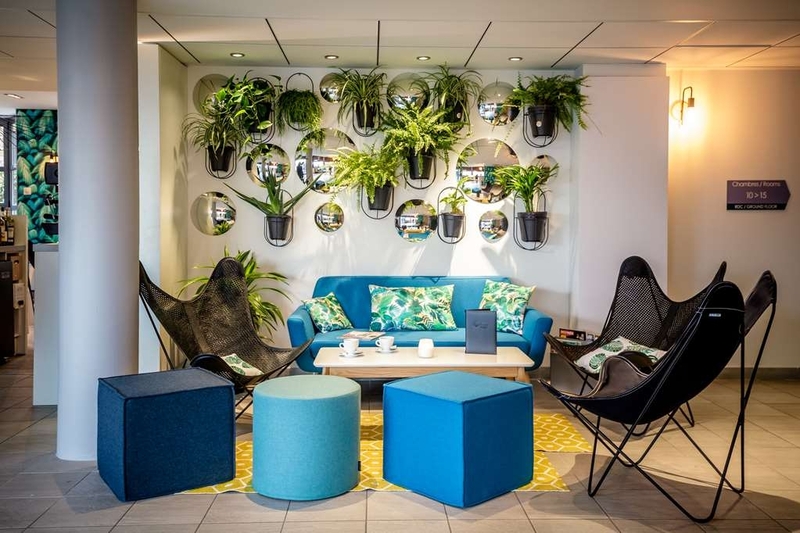 The hotel is modern, clean, has good sized rooms, friendly efficient staff and an excellent restaurant.There are also plenty of restaurants and cafes in the centre. Parking is available under the hotel, at 10 euro per night, with lift access to all floors.The road to the hotel is straight forward but we used our Sat Nav and its instruction took us past it, look up when you reach the square. A good hotel in a great location, free parking opposite- we could see our car from our room. A perfectly nice room everything you needed, free wi fi, the great thing about this hotel is the location, it is a few minutes walk from the old town centre and all the restaurants, bars and shops. Vannes has a great range of places to eat and loads of nice bars, we hit the music festival and watched local traditional musicians, children in traditional costume and local people all participating in music and dance. It was easy to get out of town in the car to visit the local area despite the heavy rain! And when we returned in the afternoon had no trouble getting s space in th car park again. Friendly and helpful staff both in reception and in the bar, the breakfast is a bit pricey but convenient, and we ate enough to skip lunch! "Not worth the price tag"
We booked the room well in advance for 4 nights. The hotel tried to charge my credit card multiple times, never managed (no idea why as the cards worked everywhere else) a d in the end cancelled my reservation. I did stay for one night, as I had nowhere to go and am glad I didn't stay longer. It isn't worth the high price. The staff isn't too helpful, they just check you in and offer no additional information or help. 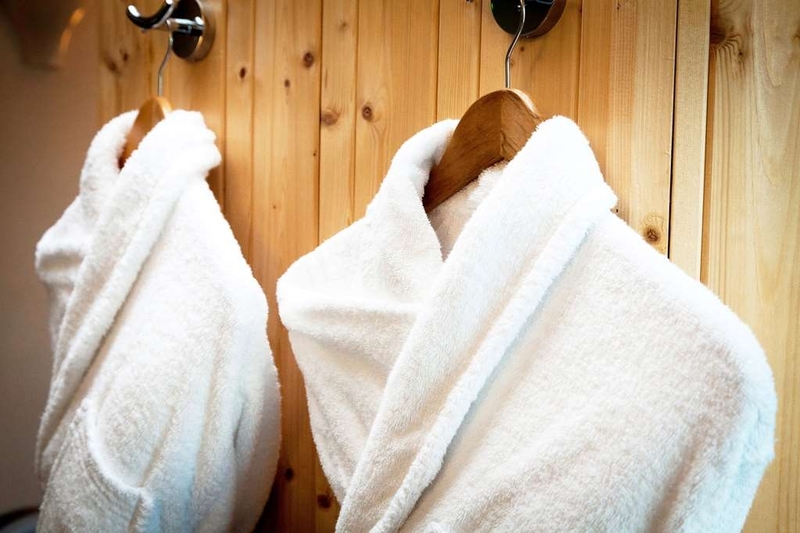 The gym and the sauna are a joke. 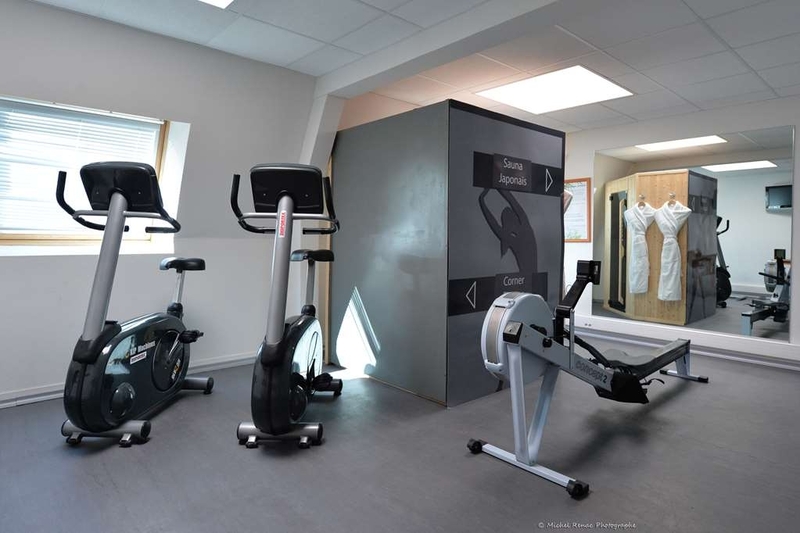 There are two bikes and one machine in the "gym" which is very small and would accommodate two people with difficulty. There are only two weights there. As I chose this hotel mainly for the gym, I am disappointed. I've seen better gyms at 3 star hotels which were cheaper. 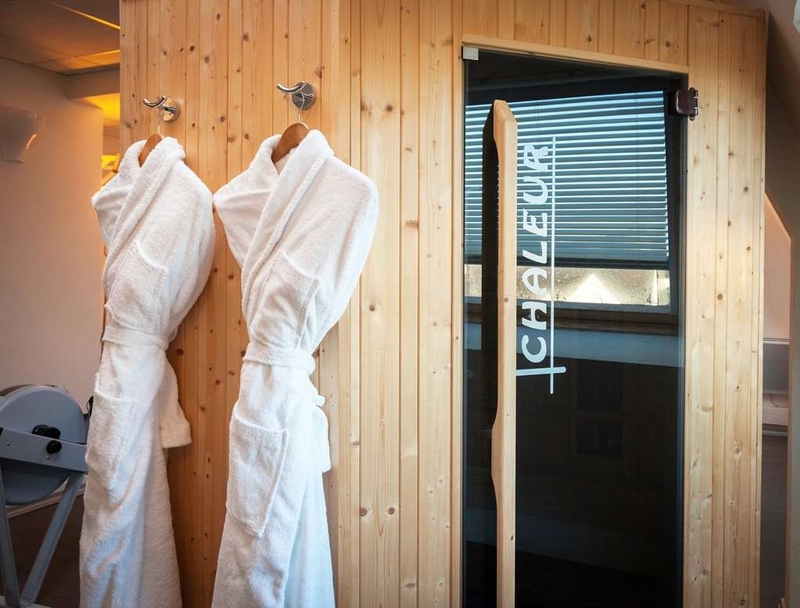 The sauna is just an infrasauna, not a proper one. There is no shower inside, so you have to run to your room to cool down. The corridor on the 2nd floor reeks of cigarette smoke. Really unpleasant. The balcony has one tin chair and is not cleaned. We got a bathroom for the disabled and the shower was a part of the bathroom, no curtain around it, so water ended up being all over the place. 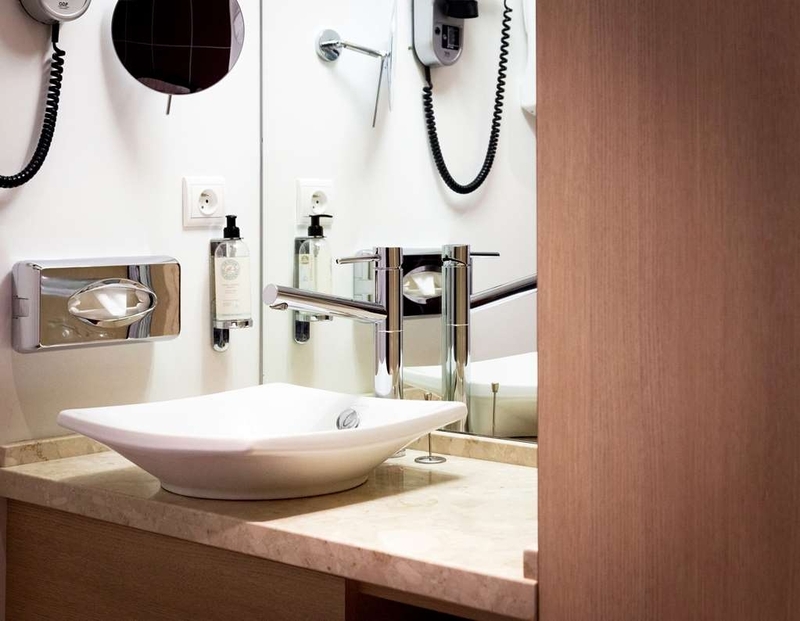 There was no space for cosmetics above the washbasin, I can't imagine staying longer. For the price I expected more.wouldn't pay this kind of mine again. And, couldn't check in earlier than 3 p.m., because the reception said that the rooms wouldn't be ready after the guests leave at 12. This is the first time this has happened in a 4 star hotel. They didn't make any effort to make us feel more welcome and comfortable.there is no minibar in the room. I've seen one in every 3 star hotel I've state in. 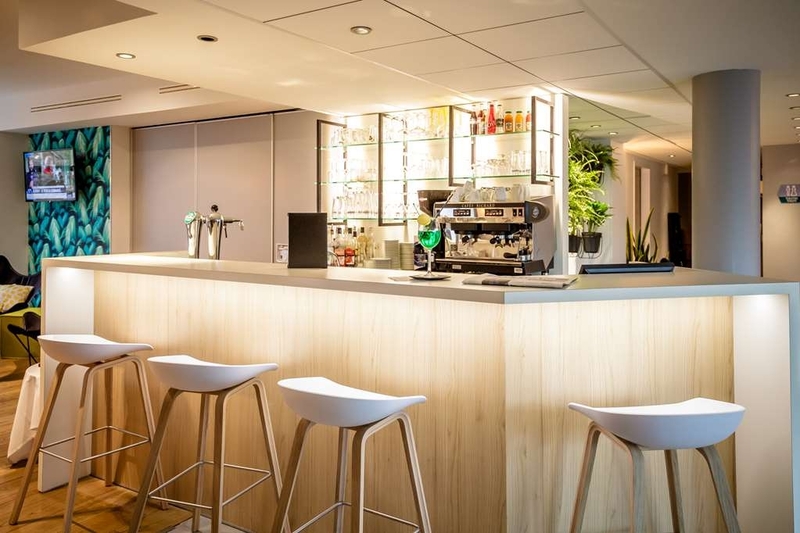 "Good hotel but do not include breakfast"
This review forms part of four reviews of hotels my wife and I stayed in on a car tour via Brittany Ferries from Santander, Spain to Roscoff, France. 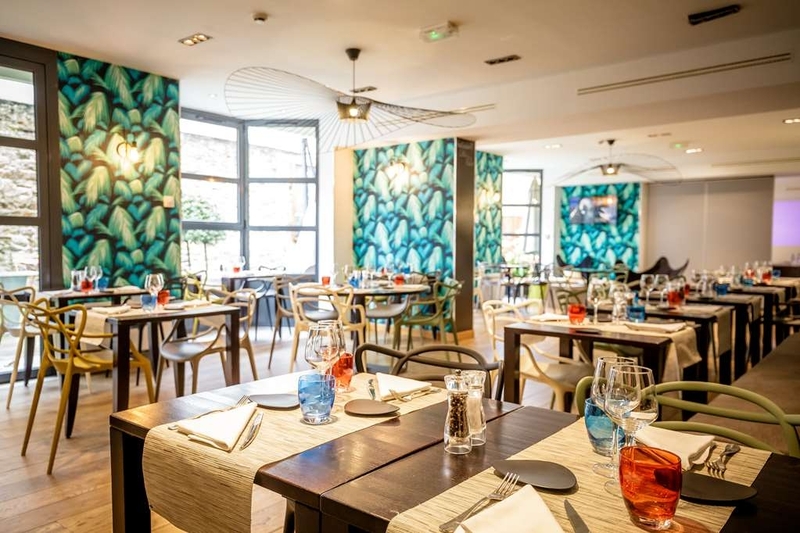 The other hotels are Tryp Orly - San Sebastian, Hotel Le B - Arcachon and Novotel, La Rochelle. We have stayed at this hotel previously and have chosen it because it is a modern hotel near the city centre. Also, because it has secure underground parking which is useful at the end of a touring holiday when our car is laden with gifts and wine. Unlike many French hotels, the parking area is easily accessed, well lit and maintained with good sized parking places at a reasonable price. Reception staff are friendly, professional and very helpful. Our room was of a good size, pleasantly decorated and well maintained. The bathroom was small but adequate. The only English speaking TV channel was CNN which compared with the 3 star Hotel Le B was very poor. Accessing WiFi proved to be a tiresome exercise requiring several visits to reception. On a previous stay at this hotel we did not include breakfast and I certainly wish that we had not bothered on this stay. The buffet area is badly laid out, with staff needing to constantly cross from one kitchen area to another. Crockery and cutlery were in short supply and when I tried to do a bit of self-help I was curtly told by a member of staff "You are not allowed to access the cutlery drawer. It is mine." There was only one hot tray which contained scrambled eggs, sausages and pancakes. A request to replenish the scrambled eggs was followed by a long delay. Croissants were so small they could have been swallowed hole with a sip of orange juice, except that also needed replenishing. I would happily recommend this hotel but would add the rider 'Don't include breakfast!' 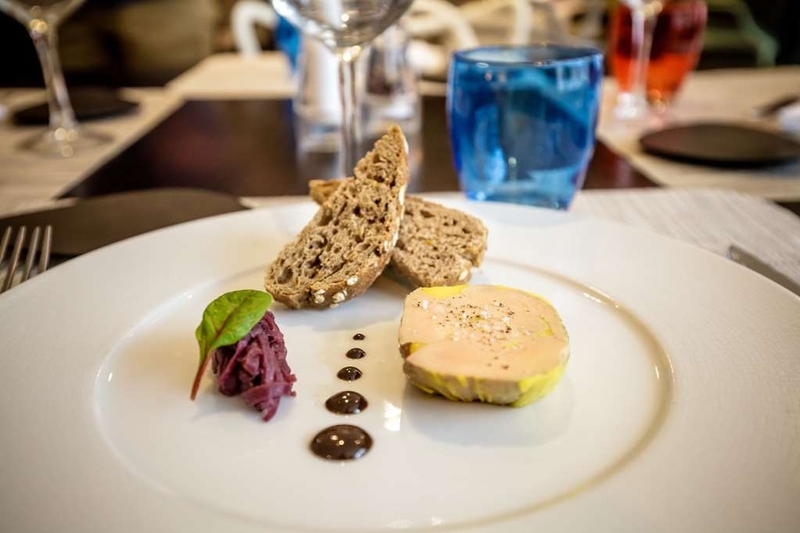 During our two night stay we eat at Le Cosy Restaurant Pizzeria and Brasserie des Halles (see reviews). Hotel is perfectly situated on outskirts of old city. Unfortunately a group of 60 American adolescents and their parents were there at the same time as us. The kids ran around the building, up and down stairwells, shouting and banging until midnight the three nights we were there. They pushed their way to take all the scrambled eggs at breakfast as soon as they came out of the kitchen. The breakfast room was mayhem with shouting and running and pushing. The staff told the parents to deal with it. The parents ignored them. 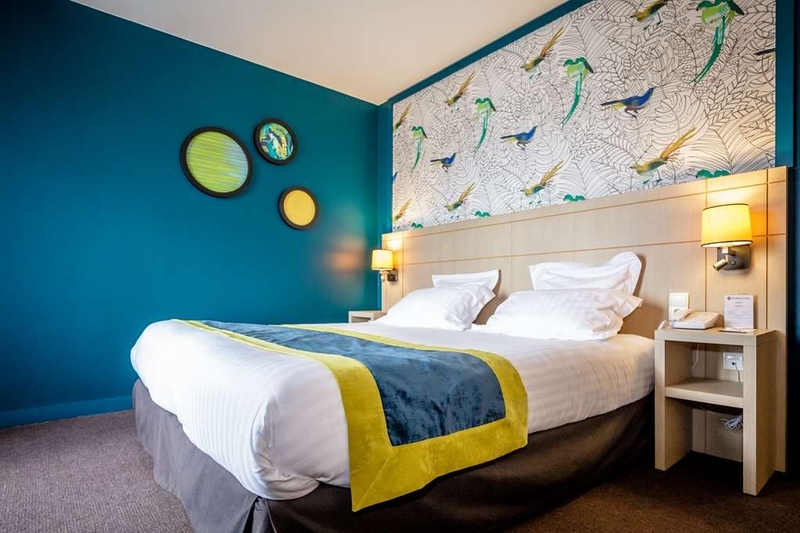 "Good location, food, room and parking"
This hotel is a good location for exploring Vannes and the Bay of Morbihan. Hotel near the centre but easy to reach by car with good local parking. Garage parking with lots of space suitable for a big car. Superior room with balcony was well worth the extra. Planned on using local restaurants but found hotel restaurant really good. 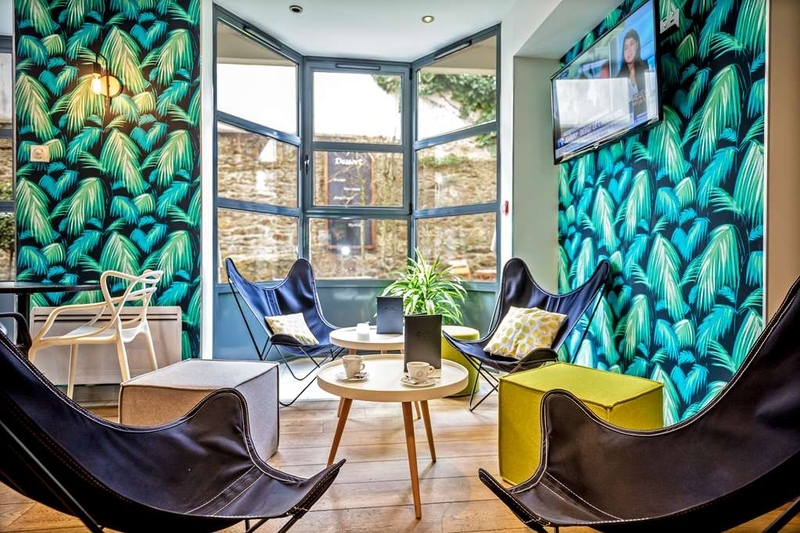 "Best Western PLUS, Vannes, france"